In this guide, we will teach you how to pair your MFi controller to the Apple TV. At the moment, you can only play games with three devices: the Siri remote, your iOS device and an MFi controller. Connecting an MFi controller is really simple and can be done by turning it on and pairing it from Apple TV’s Settings app and proceeding to Remote>Devices>Bluetooth. All games on the tvOS App Store offer useful tips, which display compatibility and support on their pages in regards to controllers and their set-up. When you’re in this menu, it tells you if there is any type of third-party controller support in Game Controller Optional. Step 5: Click on the controller under Other Devices. And that’s how you pair your device to your Apple TV. Something worth noting, your Bluetooth controller will not only give you control over games, but over basic Apple TV interface options. 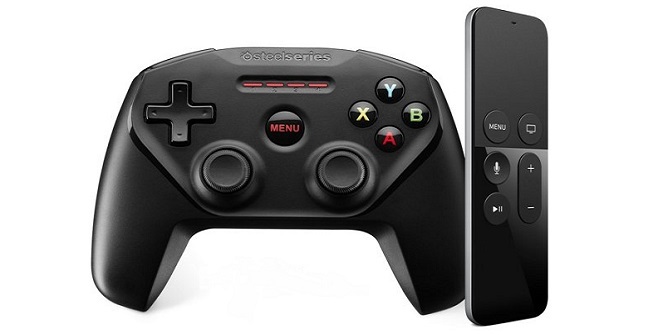 In addition to this, the SteelSeries Nimbus features a Menu button in the middle of the controller, which is used for navigating the Apple TV’s menus. Will you be getting a controller for your Apple TV? Let us know.